Cherry è una artista eclettica e di grande talento, alla quale ho rivolto alcune domande. Tani Thor: Che cosa ti ha portato in Second Life? Cherry Manga: Un caro amico di RL mi ha parlato di Second Life e mi sono incuriosita. L’ho provato, e mi sono innamorata… non sono più uscita! Tani: Che cosa è l’Arte per te in Second Life? Cherry: L’Arte in Second Life è esattamente ciò che l’Arte è ovunque… la capacità di creare. La differenza più importante con le opere di arte classica, come la pittura, è che in Second Life è possibile immergersi con il proprio avatar per sperimentare l’opera d’arte. L’arte è difficile da definire, per me, l’arte è potente quando mi dà emozioni o, fammi pensare, quando stuzzica i miei sensi. Tani: Cosa ti ha spinto a fare arte in Second Life? Cherry: Quando ho iniziato a importare le mie texture in Second Life, ho ricoperto le pareti della mia casa prefabbricata con i miei disegni, è stato il primo approccio. Una signora è venuta alla mia land, e siamo diventate amiche… Un giorno lei mi ha chiesto se mi sarebbe piaciuto costruire una galleria per lei, e l’ho fatto. Abbiamo dovuto riempire questa galleria, lei ha invitato gli amici RL ad esporre i loro dipinti ed io ho esposto i miei. Poi ho iniziato pian piano a costruire, e ho costruito paesaggi, sculture e tutto ciò che era possibile creare. Tani: Cosa ispira le tue creazioni? Cherry: L’ispirazione principale per me è la natura, gli elementi, le energie del nostro mondo… Una foglia sospinta dal vento, una bella canzone, un sorriso, una lacrima, il calore del sole sulla pelle, il mare… Principalmente, creo quello che sento, i miei lavori descrivono emozioni. Tani: Sei un artista in RL? Cherry: Se la pittura, la scultura e il disegno fanno di me un’artista, sì, lo sono. Non una artista professionista. Tani: C’è qualche artista da cui trai ispirazione in Second Life o RL? Cherry: È molto difficile citarne qualcuno, ce ne sono tanti da cui trarre ispirazione, quindi cerco di indicare quelli che mi ispirano in questo momento! Jérome Bosch, Toulouse-Lautrec, Enki Bilal, Yann Minh, Egon Schiele, Cocorosie, Lou Reed, Mother Nature, Morlita Quan, Anley piers, Nessuno Myoo, Mikati Slade, Claudia222 Jewell, Cica Ghost, Romy Nayar, Ux Hax. Tani: C’è un sito dove si possono vedere le tue creazioni? Cherry: Condivido la sim Mysterious Wave con Anley Piers presso The Dark Swamp. Sono anche owner di una sim in opensim Terra-Mater nella Francogrid. Tani: Quali sono le tecniche creative che utilizzi nel tuo lavoro? Cherry: La grandezza del building in Second Life è che mi fa lavorare su diverse tecniche, modellare, scolpire, texturing. Photoshop, Blender e Zbrush sono gli strumenti che uso per creare in SL. In RL preferisco acrilico e argilla. Tani: I progetti per il tuo futuro artistico in Second Life? Cherry: Mi piacerebbe fare più collaborazioni con builder e musicisti. Un grazie a Aloisio Congrejo per le traduzioni. Eclectic artist of great talent, to which I have a few questions. Tani Thor: What brought you in Second Life? Cherry Manga: A very close RL friend spoke to me about Second Life and her curioisity about it. I tried, and felt in love with it, ….she didn’t ! Tani: What is art for you in Second Life? 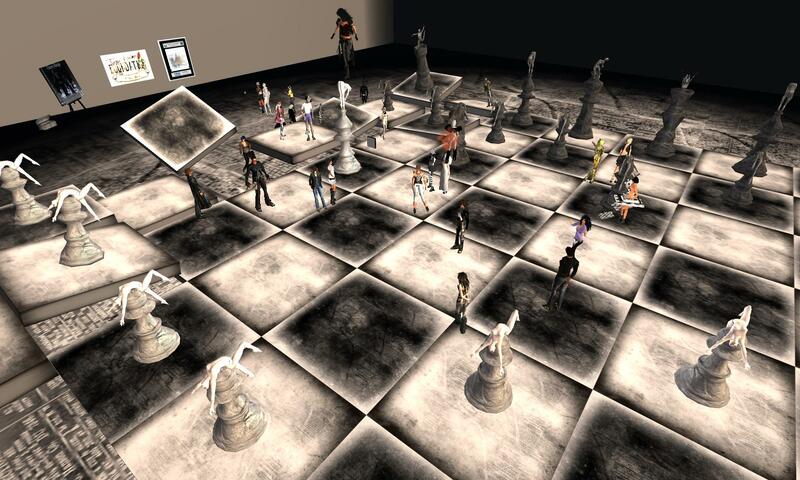 Cherry: Art in SL is exactly what Art is everywhere… an ability to create. The most important difference with classical art works such as painting is that in Second Life you can immerse yourself via your avatar to experiment the artwork. Art is hard to define, to me, art is powerfull when it gives me emotions, or let me think, or teases my senses. Tani: What prompted you to make avrt in Second Life? Cherry: When I started to import my own textures in Second Life, I covered the walls of my prefab house with my drawings, it was the very first biginning. A lady came to my land, and we became friends..A day she asked me if I would like to build a gallery for her, that I made. We had to fill this gallery,she invited RL friends to exhibit their paintings, and I installed mine. Then I started to build slowly, and I built landscapes, sculptures, everything that was possible to make. Tani: What inspire your creations? Cherry: The main inspiration to me is Nature, the elements, the energies of our world…A leaf spinning in the wind, a beautiful song, a smile, a tear, the heat of the sun on the skin, the sea….Mostly, I create what I feel, my works speaks about emotions. Tani: Are you an artist in RL? Cherry: If painting, sculpting and drawing makes me an artist, so yes I am. Not a professional one. Tani: Is there any artist that inspires you in SL or RL? Cherry: It is very hard to name few of them as there are a lot I find inspiring, so let’s give a try for the inspiration of the moment! Jérome Bosch, Toulouse-Lautrec, Enki Bilal, Yann Minh, Egon Schiele, Cocorosie, Lou Reed, Mother Nature. Morlita Quan, Anley piers, Nessuno Myoo, Mikati Slade, Claudia222 Jewell, Cica Ghost, Romy Nayar, Ux Hax. Tani: There is a site where you can enjoy your creations? Cherry: I share Mysterious Wave sim with Anley Piers, at The Dark Swamp. I also own a sim in the opensim Francogrid, Terra-Mater. Tani: What are the creative techniques that you use in your work? Cherry: The great aspect of building in Second Life is that it makes me work on several technics, modelling, sculpting, texturing. 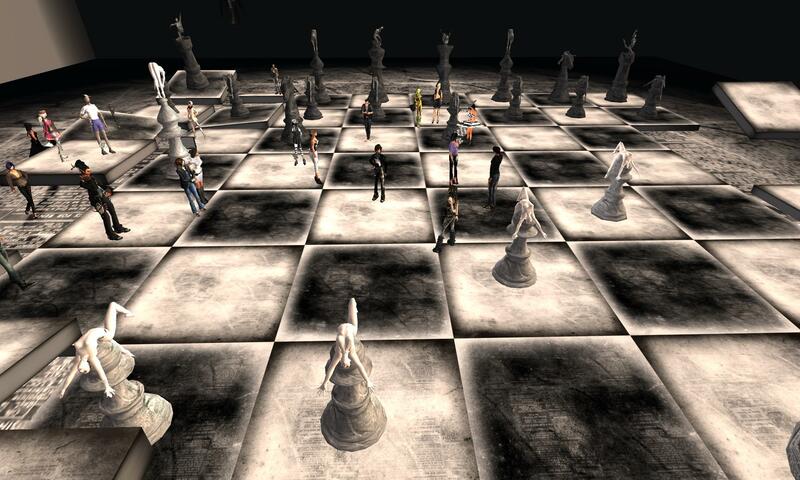 Photoshop, Blender and Zbrush are the tools I use to create in SL. In RL i prefer acrylic and clay. Tani: Projects for your artistic future in Second Life? Cherry: I would love to make more collabs, with builders and musicians. Thanks to Aloisio Congrejo for the translation.